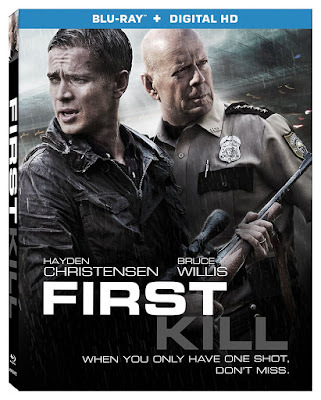 The action thriller set in the woods with an outnumbered protagonist is so cliché that I actually had higher hopes that director Steven C. Miller would make better use of it, especially with Bruce Willis in the cast. While it is predictable and goes in all of the places you would expect the film to, nobody seems to be having any fun with the premise. The entire experience feels perfunctory, lacking any creativity or visual flair (found in many of Miller’s previous films) that could have made the formulaic script more enjoyable. Even the casting of an iconic action star counts for little if you can’t get him to do much more than show up. As significant as the casting of Willis may appear to be for an action film, the real star is Hayden Christensen, whose career quickly floundered after his portrayal of Anakin Skywalker in the Star Wars prequels. Christensen plays a Wall Street broker named Will, who decides that a family vacation to the cabin where he grew up is what his son (Ty Shelton) needs to help him stand up to a bully at school. Will intends to teach his son how to hunt as a way to build up his confidence, but they face unexpected dangers when the two of them witness a corrupt cop shooting a wanted bank robber in the woods. Will takes the injured bank robber back to their cabin where his doctor wife (Megan Leonard) can patch him up, only to have his son kidnapped as a result. In order to track down the man who took his son, Will is forced to team up with the small town’s police chief (Willis), despite suspicions that more of the officers may also be corrupt. This heads down a predictable path, though this is less of a problem than the screenplay’s inability to garner any enjoyable spectacle from the situation. Too much of the 102-minute film is wasted on scenes of numerous male characters bonding with the bullied young boy, who is the weak point in both the screenplay and casting. Too little time is dedicated to giving Willis material he can flesh into something memorable. Or perhaps he just isn’t trying, but either way, the result is nothing short of bland and forgettable. The Blu-ray release is fairly unnecessary, as the film doesn’t add any visual flourishes to enhance the unremarkable screenplay. Despite the fact that the film feels like it was made without much thought or effort, there are surprising number of special features included on the disc, along with a Digital HD copy included with the purchase. The highlight of these extras is a director’s commentary track, though there is also a promotional behind-the-scenes featurette, cast/crew interviews, and a handful of deleted scenes.